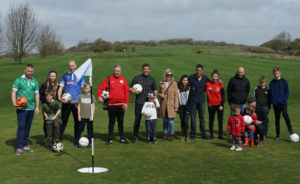 We have tried to make Brighton Footgolf accessible and affordable to everyone, meaning we want to give people a chance to have some fun and try out our amazing footgolf course. Special Footgolf balls are can be provided in either size 3 or 4 or 5 and come in 5 different colours which we hire for only £1 per ball. However, you are more than welcome to bring your own football to use should you wish. Scorecards and pencils are provided free of charge, so you can take them away with you and challenge yourself to better your score next time. yes we will look after all of you students with rates from only £7. of course we will offer you amazing people a 10% discount as well. We offer 10% discount, for group sizes of 12 or more during the week. every birthday party package is pretty much bespoke to you and your budget. We can offer; food, drinks, chaperone, decorations, party bags, personalised football for the birthday person. It is easier for you to give us a call on 01273 761001 and discuss what you would like, or send email richard@brightonfootgolf.com giving us an idea of what you would like because we want your birthday party to be the best one yet. oh fellas, do we have some quality fun footgolf things for you to do. We are literally a 5 minute taxi from the heart of Brighton, and just off the main roads, so perfect first stop if you want to kick off the stag party in style. Ask us about our Caddy Candies? Again give us a call on 01273 761001 , or ping over an email to richard@brightonfootgolf.com to discuss what you would like. We will endeavour to make some fun memories for the groom to be!